T-304 Stainless steel will never rust. 5/16" U-Bolt w/standard nut, uses 9/16" socket. Saddle with reinforced ribs & round holes. Natural Mill finish. Can be brushed or polished prior to installation. 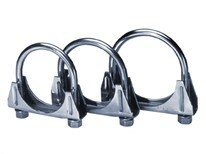 It is recommended that hand tools be used to install these clamps. Power assisted wrenches may damage them. MADE IN THE WHS. DO NOT NEED TO MAKE A PACKET.